More Olympic Fever. Looks like the temperature is really rising! 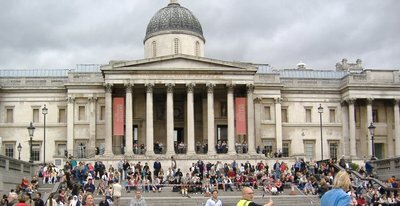 Seems I can't escape the Olympics, especially when you are living with 3 very patriotic Brits. This past weekend and the last few days have been very good to Britain in Beijing. They won a mass of Gold medals, and now sit at 3rd in the overall standings, behind only China and the USA. Many of those medals came in Sailing and Cycling, where Team GB's strategy of co-locating all their cycling athletes in Manchester at a state of the art, well-funded facility has paid off handsomely. 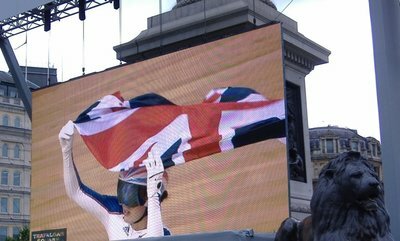 Of the 10 events at the velodrome this Olympics, GB has won 12 medals, including 7 golds, putting them well ahead of the next closest team, Spain, with 3 medals. 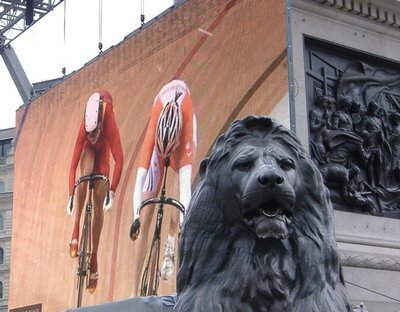 I wandered down to Trafalgar Square today to catch two of those Olympic golds in the Men and Women's Sprints. 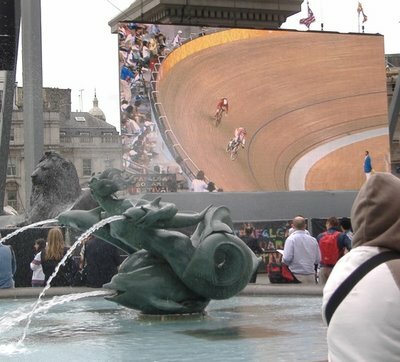 A massive video screen has been set up in Trafalgar Square, and has become an impromptu living room / party room, with moments of tension as people watch events, and moments of levity as they celebrate the winners. 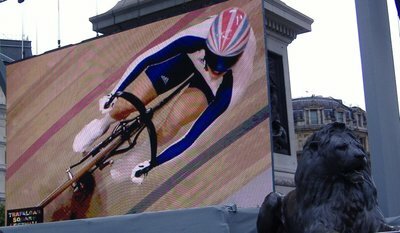 Victoria Pendleton won her gold medal match in the Women's Sprint, bringing cheers from the assembled crowd. Next up, Chris Hoy of Great Britain beat Jason Kenny, also of Great Britain, to give a Gold and Silver finish to the Men's Sprint, and made Chris Hoy the first British person to win 3 gold medals in a games since 1908. More cheers from the crowds, the medal ceremony and then the song... God Save the Queen. I've been hearing it a lot lately. Haven't heard too much of O Canada, unfortunately. It's only been played twice this Olympics. Sigh. I guess there is always 2012. Today, I found a barber not far from my place that I like. He's just across the river in Greenwich. £12 for a "Gents" cut. I guess I am a gent. Did a nice job with my hair, and despite the fact that he gave me a bit of a dressing down due to the fact that I sometimes shave my own neck between cuts (which causes ingrown hairs), I am for sure going back. Yay, yet another little bit of "settlement" news. 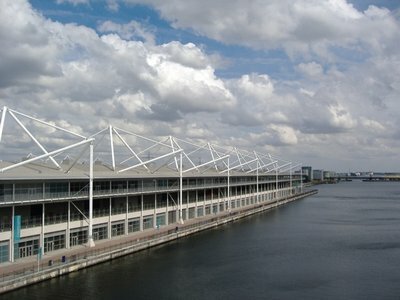 While the 2012 Olympic site at Stratford is still mostly dirt, one site is up and running already, the ExCel Centre in the east end of the Docklands. I took a walk down that way the other day. It's a pretty impressive building, at least from the footbridge going across the Royal Victoria Docks. The roof is all spikey, white bars, almost like a giant constructor set. Unfortunately, from the ground it's just a big box. To make a nice picture of it, you have to dress it up with something in the foreground blocking part of the view, like this handily placed crane. ExCel will be hosting Boxing, Fencing, Judo, Table Tennis, Taekwondo, Weightlifting and Wrestling. Walking out to the ExCel Centre I followed the North Bank of the Thames, and then cut up and walked along the north side of the Royal Victoria Dock. 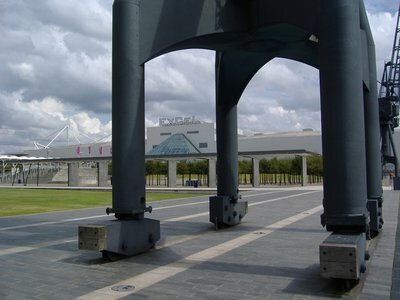 The area around Royal Victoria Dock is well developed, with a number of nice apartment buildings and a few bars and restaurants. On my way back, I decided to see a different part of London, so I crossed over the DLR tracks to Victoria Dock Road. It is just north of the ExCel Centre and the condo apartments at Royal Victoria Docks, but is a very different place from it's neighbour on the south side of the DLR tracks. On the north side of the DLR tracks is a lot of run down looking housing, and mostly scuzzy looking businesses, many of which seemed closed permanently. Walking further along towards Canning Town, I came across a car on the side of the road that was completely destroyed by fire. 4 cars down from that, a car with it's passenger side window smashed, glove box open and papers strewn around the car. I thought about taking a photo, as it reminded me almost of the kind of shots you see from war zones, but then though better of hauling out my camera in an area where, apparently, people smash and grab and on occasion burn cars. Past Canning Town Station, though, suddenly everything changes again, with more pricey looking condos and shiny office blocks. A lot of the businesses along the Victoria Dock road close to Canning Town were shut down, not for lack of business, but because the land was reclaimed for a massive redevelopment project. When walking along, I couldn't help but feel that it would only be a matter of time until the gentrification oozed its way north and east and all those burnt out cars and run down flats would be replaced by condo high-rises and California-Thai-Mexican fusion restaurants. Closer to the Thames River in Silvertown, development hasn't quite taken hold. It's still an industrial area with few opportunities for a pedestrian to get close to the water. 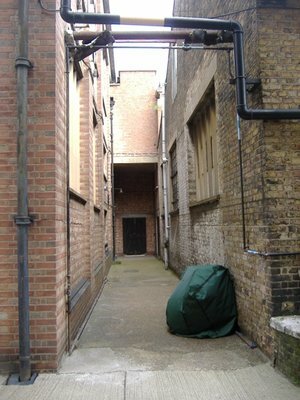 About the only reclaimed part there is the area called Trinity Buoy Wharf, which has been remade from a Buoy manufacturing and maintenance facility into a centre for arts and artists. 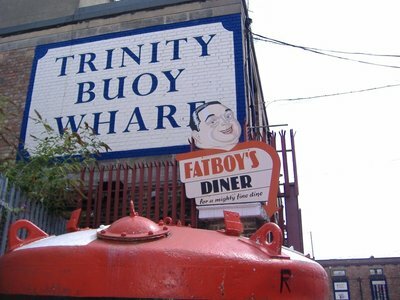 (I didn't get to try Fatboy's Dinner. They were closed for August vacation). Ironically, as part of the scheme, they have converted a lot of large shipping containers into art studios and small craft shops. This is ironic as it was ultimately the shipping container and the Port of London's inability to deal with the massive cranes and ships required to move shipping containers that lead the docklands to close and be redeveloped. 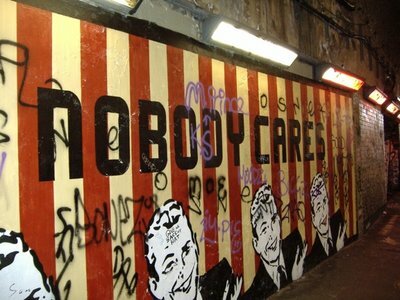 Then again, given they are artists, perhaps that is a statement in of itself? 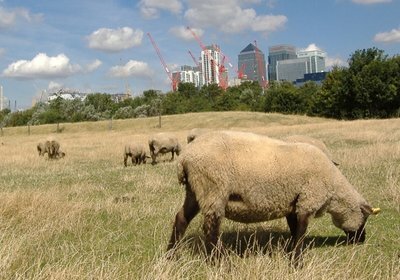 Further east, south of Royal Victoria Dock and heading towards London City Airport is a large section of land that is unused. The area used to be manufacturing and shipping, but with the closure of the docks, it has mostly gone to fallow. Walking along North Woolwich Road, I found another casualty of the docks closing. 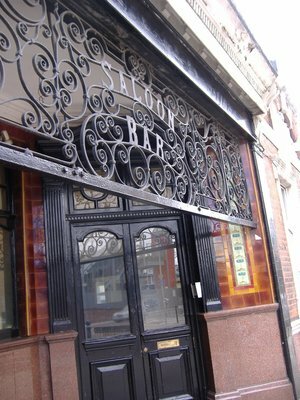 With no thirsty dockhands looking for a pint, there is no reason to keep the pub open. 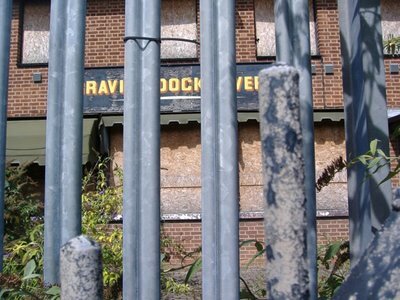 Boarded up, abandoned and surrounding by two metal fences, the Graving Dock Tavern closed up in the 2002. Graving Docks, by the way, where used to clean the hulls of the ships. 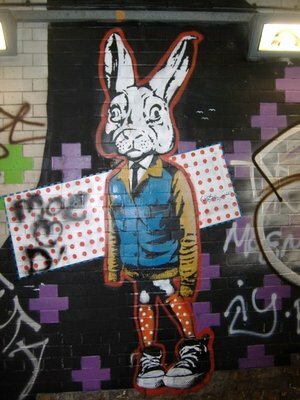 Continuing to geographically hop around without any sort of rhyme or reason, here's some photos from an underpass near Waterloo Station. Graffiti is allowed and encouraged in this area, and there are some interesting pieces of art. I know I've shown this picture before, but I really like it. There is something very cool about the juxtaposition of the farm animals and the skyscrapers. I think every city should have a farm pasture right in the middle of downtown. It would be a great way for stressed-out office workers to relax during their lunch breaks. Rhyme and reason are entirely overrated. I quite enjoyed this one. 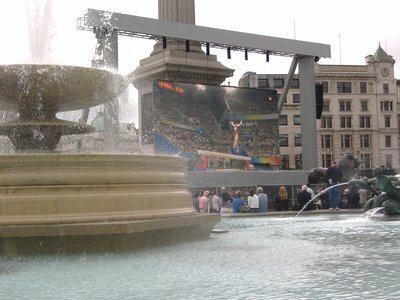 There have been no giant screens erected anywhere in Denver, but I did see Phelps win his eighth gold in a bar. Everyone was cheering and going nuts (even though preseason football has started and was conveniently playing on the other tv). It was great! Also, Chris Hoy's helmet is a little bit Bladerunner or something. It's amazing for me to believe that the futuristic visors make that much of a differece.